The vestibular system plays a key role in stabilising the image of the visual world during head movements and the body and the head in space. It is a rapid system that involves two main types of reflexes: the vestibulo-ocular reflex and the vestibulospinal reflex. At the peripheral level, the canal receptors detect the angular acceleration of the head in space, and the otolith receptors detect the linear acceleration and inclination of the head relative to gravity (Blanks & Precht, 1976, Graybiel, 1963). Their role is to continually inform the integrating centres about body and head positions and movements in space. Sensory information is relayed by the primary vestibular neurons, whose soma is located in the Scarpa’s ganglion, to the vestibular nuclei. At the central level, vestibular nuclei, located in the brainstem, and secondary vestibular neuron projections, can be found around the spinal cord, cerebellum, oculomotor nuclei, thalamus and cortex. These vestibular nuclei are at the centre of sensorimotor integration, and receive vestibular, somesthetic and visual information (D.W. Schwarz, Rubin, Tomlinson, Milne, & Fredrickson, 1975). The vestibulo-ocular pathways serve to stabilise images on the retina during head movements, via the vestibulo-ocular reflex (VOR). The vestibulospinal pathways stabilise the head through the vestibulo-nuchal reflex (VNR) and the body’s stability in space thanks to the vestibulospinal reflex (VSR). The vestibulo-thalamo-cortical pathways are responsible for sensory perception, which is often at the root of rotatory vertigo symptoms. The secondary vestibular neurons project to the spinal moto neurons which stabilise the head via the vestibulo-nuchal reflex (VNR) and the body’s stability in space through the vestibulospinal reflex (VSR). VNR and VSR play a key role in postural control as well as in adaptation and rebalancing reactions. 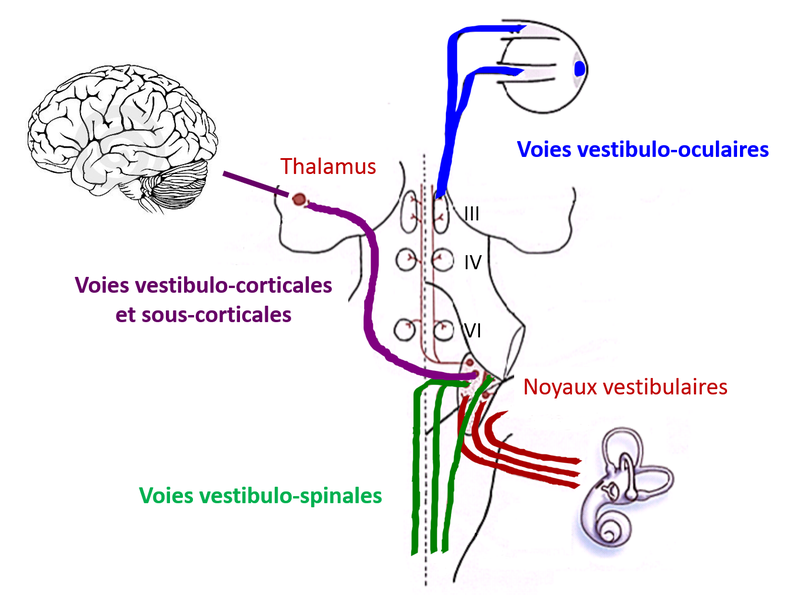 The vestibular neurons are also connected to the extra-oculomotor nuclei (cranial nerves III, IV, VI, which stabilise images on the retina during head movements). This is known as the vestibulo-ocular reflex (VOR). Finally, other pathways are responsible for sensory perception which are often at the root of rotatory vertigo symptoms; these are the vestibulo-thalamo-cortical and subcortical pathways (Blum & Gilman, 1979, T Brandt & Dieterich, 1999). The vestibulo-ocular pathways stabilise the vestibulo-ocular reflex (VOR). The VOR is a fast three-neuron reflex arc (Baker et al., 1981) with a time lag of 5 to 7 ms (Huterer & Cullen, 2002; Minor, Lasker, Backous, & Hullar, 1999). Its purpose is to stabilise the image on the retina during rotations of the head. For this, the VOR generates rapid and compensatory eye movements (in the same direction but in the opposite direction of the head movement). Normally, when the head moves in one direction, the eyes move in the opposite direction at the same speed. For example, with a head movement to the left, the anterior horizontal semi-circular canals are stimulated. Activation of the primary neurons of the horizontal semi-circular canals causes the eyes to rotate in the opposite direction to the angular movement of the head, i.e. to the right. The peripheral vestibular system is made up of two types of hair cells: Type I cells and type II cells. 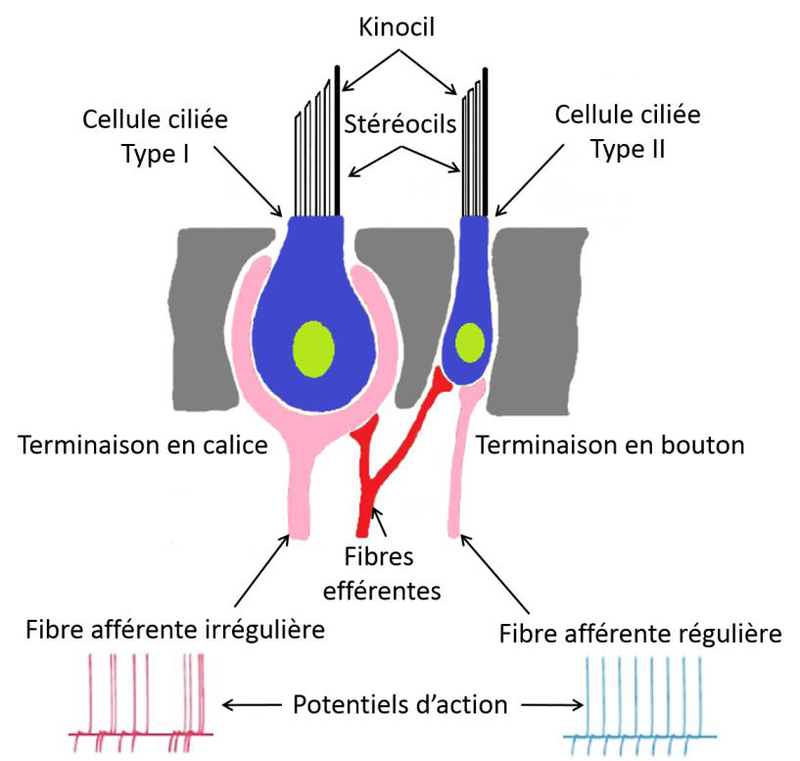 Type I hair cells are pyriform with a calyx-shaped neural junction. A calyceal nerve ending can innervate from one to four hair cells. Type II hair cells are cylindrical and have multiple neuronal junctions with bud-shaped nerve endings. The distribution of these sensory hair cells within the ampullary crest of the semi-circular canals is unique. Movement of endolymph fluid bends the stereocilia. Bending of the stereocilia towards the kinocilium causes a stimulating effect (depolarization) whereas bending in the opposite direction causes dysfacilitation (hyperpolarization). Type I and type II hair cells are associated with irregular and regular primary vestibular neurons respectively. This regular and irregular classification refers to the regularity of discharge of the neuron action potentials. It is determined by the time interval between two action potentials. The information is transmitted by the regular or irregular neurons according to stimulation (frequency and acceleration of head movements). In general, irregular neurons are larger in diameter, more sensitive to head movements and with a stronger acceleration due to their higher response gains. Regular neurons, on the other hand, are smaller in diameter, have a higher conduction velocity and a lower response gain. The signal they provide is proportional to the speed of head movement. The two types of primary vestibular neurons have a basal (resting) activity of between 70 to 100 action potentials per second (Goldberg, M. 2000, Lysakowski, Minor, Fernández, & Goldberg, 1995). During stimulation, this high basal discharge activity makes it possible to activate or to dysfacilitate neuronal activity. The cell bodies of primary vestibular neurons are located in the upper and lower divisions of Scarpa's ganglion, located within the internal auditory canal. The branches of the vestibular nerve pass through the internal acoustic meatus to project to the central vestibular nuclei neurons on either side of the fourth ventricle in the dorsal aspect of the brainstem. There are five vestibular nuclei (Victor Joseph Wilson & Jones, 1979): medial, superior, inferior, lateral and Y group. 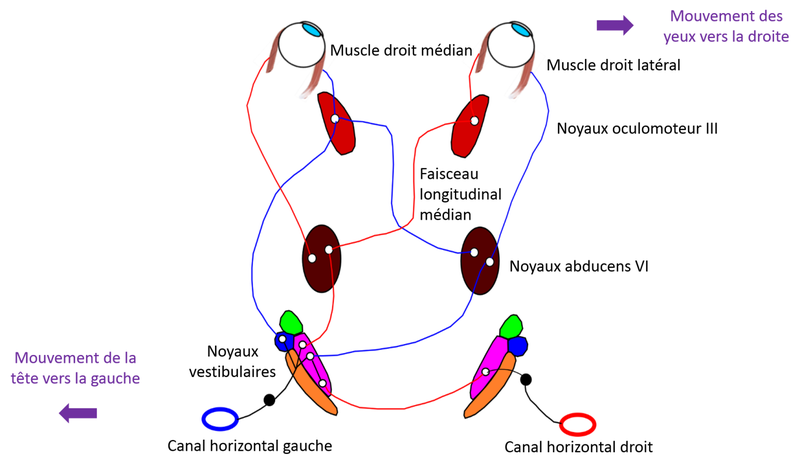 The primary vestibular neurons of the superior branch of the vestibular nuclei project to the upper and medial vestibular nuclei. The primary vestibular neurons of the lower branch of the vestibular nuclei project to the medial, lateral, or inferior vestibular nuclei. The central vestibular nuclei are located on both sides of the fourth ventricle in the dorsal part of the brainstem. There are five in total: superior, lateral, medial, inferior and Y group. The vestibulo-ocular pathways project onto cranial nerves III (oculomotor), IV (trochlear) and VI (abducens) via the median longitudinal fasciculus. The vestibulospinal pathways are organised into three bundles: lateral, medial and caudal. Each of the six extraocular muscles (lateral rectus, medial rectus, superior rectus, inferior rectus, superior oblique, inferior oblique) are innervated by one of three cranial nerves; oculomotor (III), trochlear (IV) or abducens (VI) (Büttner-Ennever, Horn, Scherberger, & D'Ascanio, 2001, Schubert & Minor, 2004, page 2). 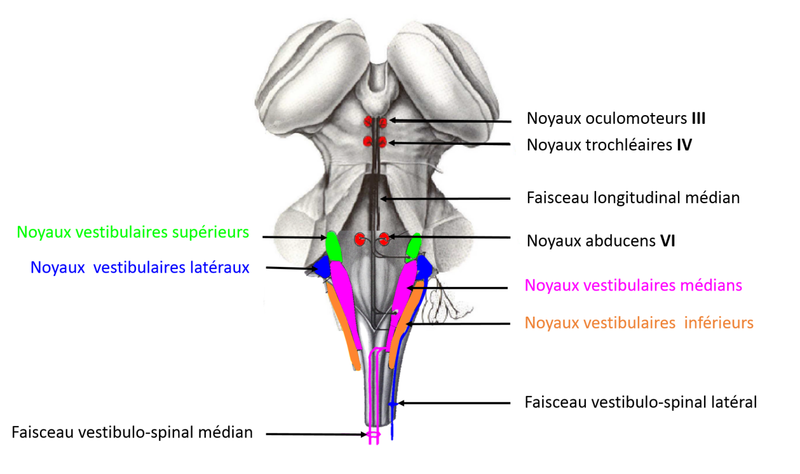 The oculomotor nerve (cranial nerve III) innervates the inferior rectus, medial rectus, ipsilateral inferior oblique, and the contralateral superior rectus muscles. The trochlear nerve (cranial nerve IV) innervates the superior oblique muscle. The abducens nerve (cranial nerve VI) innervates the ipsilateral lateral rectus muscle and the contralateral internal rectus muscle. The vestibulo-ocular pathways include a primary vestibular neuron that transmits sensory information from the vestibular hair cells, a secondary vestibular neuron that allows the integration of different sensory information at the vestibular nuclei level, and an ocular motor neuron that receives the motor command which is then projected onto the eye muscle fibres. For example, during head rotations in the horizontal plane, the ampullary crest of the rotating ipsilateral horizontal semi-circular canals will be activated. Primary vestibular neurons from the horizontal semi-circular canals will project to the medial and lateral ipsilateral vestibular nuclei. Some of the secondary vestibular neurons will decussate to innervate the contralateral abducens nerve (cranial nerve VI). The motor neurons of the abducens nerve will then innervate the neuromuscular junction in the lateral rectus muscle. Other secondary vestibular neurons will directly innervate the ipsilateral oculomotor nerve (cranial nerve III). The motor neurons of the oculomotor nerve will innerve the medial rectus muscle. Finally, another group of secondary vestibular neurons will project on the ipsilateral abducens nucleus. From the abducens nuclei, the neurons descend within the median longitudinal fasciculus to project onto the contralateral oculomotor nuclei and then onto the medial rectus muscles. (Baker, Evinger, & McCrea, 1981; A Berthoz, Droulez, Vidal, & Yoshida, 1989; Dieringer, Pantle, Reichenberger, & Straka, 1996). Similar patterns exist for the anterior and posterior semi-circular canals. The majority of vestibulo-ocular pathways are derived from the superior and medial vestibular nuclei, but, unlike in the vestibulospinal pathways, there is no fasciculus organisation. The vestibulo-ocular reflex is measured by two parameters: gain and phase. Vestibulo-ocular gain can be defined as the change in the head angle in relation to that of the eye. Vestibulo-ocular gain is the speed of the eye divided by the speed of the head. Normal gain is equal to -1. The vestibulo-ocular reflex phase represents the temporal relationship between the position of the eye and that of the head. Ideally, the position of the eye should, for a given time, be equal to the opposite of the position of the head. Generally speaking, a phase shift is equal to zero. The vestibulospinal pathways support two reflexes: the vestibulospinal reflex (VSR) and the vestibulo-nuchal reflex (VNR). The vestibulospinal reflex is a support mechanism for the body’s posture and centre of gravity. During head movements, the lower and upper limbs ipsilateral to the direction of acceleration are extended while those contralateral to the acceleration are contracted. It plays a major role in maintaining balance while standing and walking. This reflex is supported by the lateral vestibulospinal pathways. The vestibulo-nuchal reflex is a stabilising reflex used to hold the head in position when the gaze is horizontal-facing (in relation to gravity) and regardless of torso movements. For example, an individual who goes climbing will shift their weight to the side. The otolith organs detect this gravitational change and cause the head to move in the opposite direction in order to keep the gaze forward-facing. This reflex seems to be related to the otolith organs and the medial vestibulospinal tract. Balance in humans is a complex function and essential to maintain an upright bipedal stance. To ensure postural control, several sensory inputs are implicated: visual, proprioceptive, somesthetic and vestibular inputs. During the ageing process, these inputs can change which explains the increased risk of falls amongst older people. 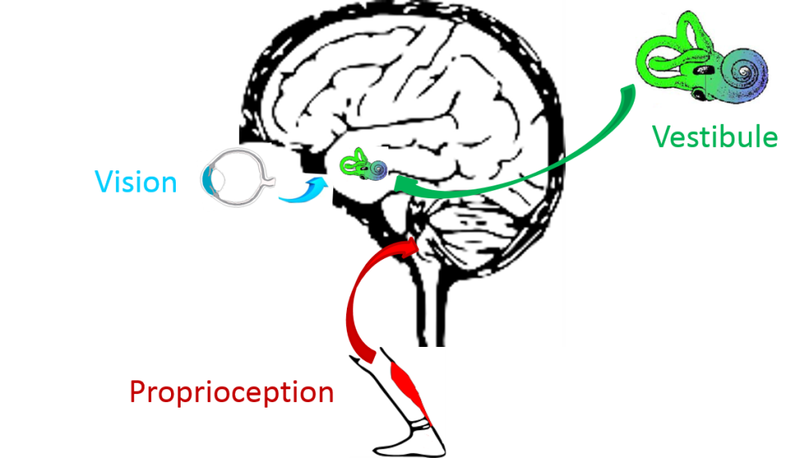 The vestibular system plays a key role in gaze stabilisation and postural control. Vestibular, visual and proprioceptive inputs play a fundamental role in gaze stabilisation and postural control. The vestibular system provides an accurate representation of head and body movements in three-dimensional space. It also generates motor responses to adapt to these movements. Thanks to vestibulo-ocular and vestibulospinal reflexes, the vestibular system stabilises the gaze and controls posture during head and body movements. In addition, the vestibular system allows the integration and perception of the body's position in space through the central neural pathways which project to the cortex, cerebellum and thalamus.